rough road or no road. 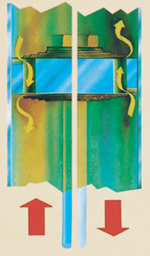 As the piston moves, oil flows through independent passageways for rebound and compression. Valving discs stacked on both sides of the piston, vary in size and thickness. These discs deflect off their seat allowing oil to flow past the piston. As suspension speed increases, more discs in the stack come into play restricting the flow of oil through the piston, increasing the shock valving and slowing the suspension movement, eliminating the need for a manually adjustable shock.